This book pagest are brown and there is a names writing on the inside but is in quality condition. Ships same day. 4.0 out of 5 starsFor a 1970's scifi - this is a well written book even today! I was pleasantly surprised by this book in two ways. First, for a 1970's pulp fiction written by a former air force officer - this was very well written! The language was tight, the dialogue was actually pretty good, and the story stayed within a self-contained and consistent universe which is important for good scifi. And second, if you are expecting this to be an entry point into the campy 1970's TV show - think again. Aside from the description of the airplane crash which prompts him to become a cyborg (it's just like the TV show starting sequence), this book is very dark. The first half of the book is about his crash and surgery and mental battles, all of which are pretty gritty stuff. He does get into some great bionic adventures in the last 1/3 or so of the book - but even there he's vulnerable and the story is suspenseful and riveting. Very impressed by this author. 5.0 out of 5 starsThis is a MUST READ for those that love the series!! It WILL SHAME the CRITICS!! You must read if you love the series on television!! Why? Well you don't think his eye ,arm & legs is all he has replaced do you?? Better read if you did!! It WILL CORRECT your critical thoughts of disbelief on some things. Examples the fight scenes with others. Enjoy! 5.0 out of 5 starsA "must read" for fans of sci-fi, action, psychology, and spy stories. 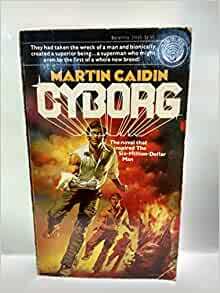 I happen to be the proud owner of a (mostly damaged) paperback copy of "Cyborg", by Martin Caidin. If you haven't read the book but are familiar with only the TV series, imagine getting all the scientific and psychological details that the TV show left out (or made up). Imagine going from popular, respected astronaut/pilot and ladies' man, to a half-blind vegetable, dependent on life support. Imagine going to sleep and waking up weeks later, to discover you now have all your limbs. A miracle? What if they weren't real limbs (real as in "human", as in "alive")? What if they turned you from "vegetable" to "freak?" wouldn't you rather be dead? But Steve Austin wasn't one to accept death, no matter how much he wanted it--no matter the cost of living. How exactly would you do surgery on a limbless man to apppend machine parts? Certainly not all at once. Maybe one limb at a time. How would you keep the patient from bleeding to death in the process? How would he heal? What would keep him from going crazy? Caidin answers all these questions as if he had lived through it himself (hmmm.....). The science is very real, the psychology even moreso. Do yourself a favor and find and read this book. You will not regret it. The author was himself a test pilot, which made the details of the settings quite realistic and believable. Unfortunately, he fell in with many of the gender stereotypes of the early 70s, and he had little fluency with personal interactions, which made the dialogue stilted at times and pulled me out of the narrative to wonder why he didn't mention something or other. I also would have liked to see more of Steve Austin's personal struggle with the man/machine he became instead of being told what he was thinking by a third party character who would not have that kind of intimate knowledge. Nevertheless, I found myself eagerly turning the pages. I think this was a nugget of something that could have been great, but maybe I'm just biased by reading it in an era where such development is expected. This book was the idea behind the TV series. Only the book was alot more serious then the TV series, which by the end of it's run turned very campy. The book on the other hand plays Steve majors off as a James Bond type of spy with a few extra tricks. It was a good read. Also it was interesting to see what they thought we might be able to do with robotic body parts and how not so far we have come. Kinda makes you wonder if James Cameron didn't get inspiredfrom this book or the TV series to write his Terminator movie. This book is simaler to another book the Author wrote called Man-fac. Though in Man-fac, the person wears a robot suite that looks very much like a human. Who knows maybe in a hundred years we'll be talking about this book and how he predicted a few things like Mary Shelly did in Frankenstein [transplants]. 2.0 out of 5 starsSilly and vapid writing. But somehow cool. Extra star for coolness. I bought it because it was the Steve Austin 6 Million Dollar Man precursor. Terrible book but cute, so...keeping it.